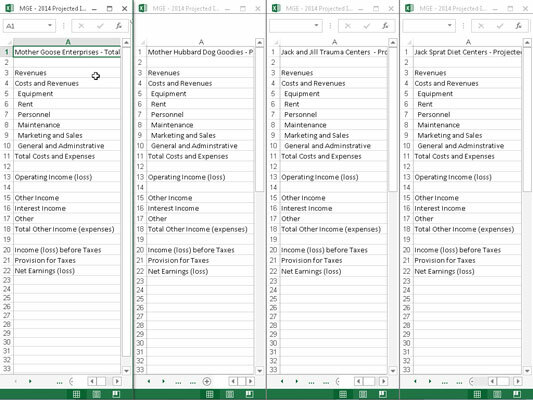 In Excel 2013, you can split a single workbook into worksheet windows and then arrange the windows so that you can view different parts of each worksheet on the screen. Click the New Window command button on the View tab or press Alt+WN to create a second worksheet window. Then click the tab of the worksheet that you want to display in this second window (indicated by the :2 that Excel adds to the end of the filename in the title bar). Click the New Window command button or press Alt+WN again to create a third worksheet window. 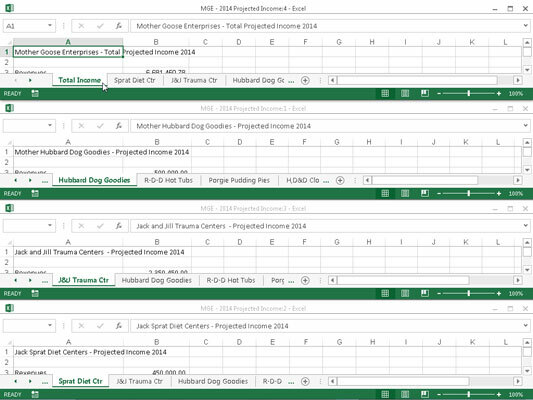 Then click the tab of the worksheet that you want to display in this third window (indicated by the :3 that Excel adds to the end of the filename in the title bar). Repeat step 2 for each worksheet you want to compare. Click the Arrange All command button on the View tab or press Alt+WA and select one of the Arrange options in the Arrange Windows dialog box. Then click OK or press Enter. Tiled: Select this button to have Excel arrange and size the windows so that they all fit side by side on the screen. Horizontal: Select this button to have Excel size the windows equally and place them one above the other. Vertical: Select this button to have Excel size the windows equally and place them next to each other. Cascade: Select this button to have Excel arrange and size the windows so that they overlap one another with only their title bars showing. Windows of Active Workbook: Select this check box to have Excel show only the windows that you have open in the current workbook. 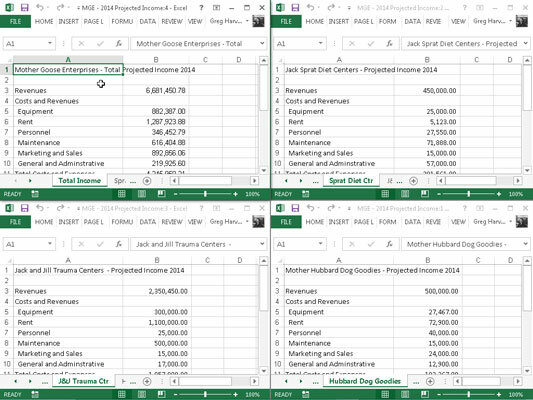 Otherwise, Excel also displays all the windows in any other workbooks you have open. Yes, it is possible to open more than one workbook provided that the device you’re running Excel on has sufficient screen space and memory. After you place windows in one arrangement or another, activate the one you want to use (if it isn’t selected already) by clicking it in the Excel program window. Alternatively, you position the mouse or touch pointer on the Excel 2013 program icon on the Windows 7 or 8 taskbar to display pop-up thumbnails for each of the worksheet windows you have open. To display the contents of one of the Excel worksheet windows without the others visible, highlight its pop-up thumbnail on the Windows taskbar. To then activate a particular worksheet window from the taskbar, you simply click its thumbnail. When you click a worksheet window that has been tiled or placed in the horizontal or vertical arrangement, Excel indicates that the window is selected simply by displaying the cell pointer around the active cell and highlighting that cell’s column and row heading in the worksheet. When you click the title bar of a worksheet window you place in the cascade arrangement, the program displays the window on the top of the stack, as well as displaying the cell pointer in the sheet’s active cell. You can temporarily zoom the window to full size by clicking the Maximize button on the window’s title bar. When you finish your work in the full-size worksheet window, return it to its previous arrangement by clicking the window’s Restore button. To select the next tiled, horizontal, or vertical window on the screen or display the next window in a cascade arrangement with the keyboard, press Ctrl+F6. To select the previous tiled, horizontal, or vertical window or to display the previous window in a cascade arrangement, press Ctrl+Shift+F6. These keystrokes work to select the next and previous worksheet window even when the windows are maximized in the Excel program window. If you close one of the windows by clicking Close (the X in the upper-right corner) or by pressing Ctrl+W, Excel doesn’t automatically resize the other open windows to fill in the gap. Likewise, if you create another window by clicking the New Window command button on the View tab, Excel doesn’t automatically arrange it in with the others. Don’t try to close a particular worksheet window by choosing File→Close or by pressing Alt+FC because you’ll only succeed in closing the entire workbook file, getting rid of all the worksheet windows you created! 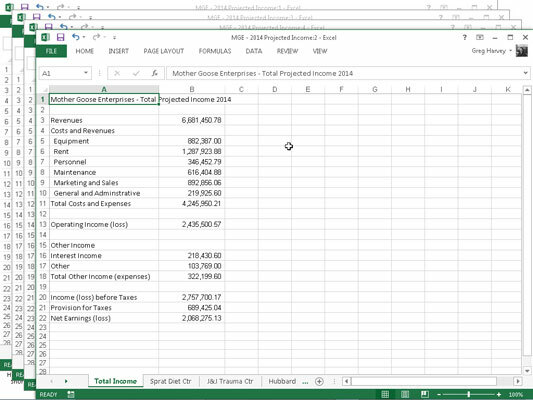 When you save your workbook, Excel saves the current window arrangement as part of the file. If you don’t want to save the current window arrangement, close all but one of the windows. Then click that last window’s Maximize button and select the tab of the worksheet that you want to display the next time you open the workbook before saving the file.